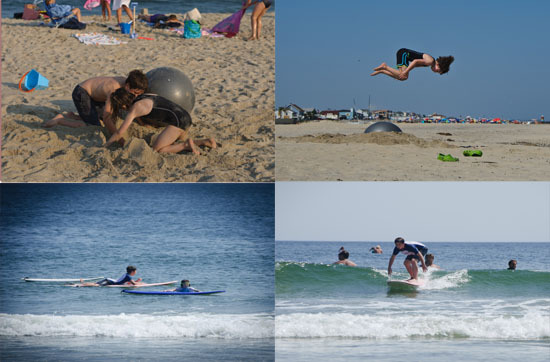 My family took a quick trip to the Jersey shore this week. And when I say quick I really mean it: we were only there for 24 hours. Anyway, since sunny days at the beach are fresh on my mind, sensible sun exposure is the focus of One Simple Change this week. Ok…back to sensible sun exposure. I’ve actually been wanting to write a post about the sun for One Simple Change for months, but I decided to wait until I’d done a significant amount of research, so I’d feel confident I was sharing the “correct” information. Have I researched all there is to know about this “hot” topic? No…not even close. Am I ready to share the opinion I’ve formed based on my previous knowledge, my recent research, and my intuition? Yes. For a long time, the prevailing opinion in the “mainstream” media has been that the sun is really terrible for you. We’ve been told that we should be afraid of the sun because it will give us wrinkles and skin cancer…and that we should only go outside if we’re wearing sunscreen. Well it IS true that sunburns are terribly uncomfortable; they also appear to put you at risk for skin cancer (sunburns acquired in childhood are particularly problematic). But I feel very strongly that we’re “throwing the baby out with the bathwater” if we avoid the sun altogether. It’s a well established fact that exposure to sunlight positively affects one’s mood…anyone who’s experienced any degree of Seasonal Affective Disorder knows this all too well. Sunlight also impacts sleep (by boosting levels of the hormone melatonin, which helps to combat insomnia), and exposure to sunlight is intimately connected to vitamin D status. Vitamin D is not really a vitamin: it’s more like a fat-soluble hormone, and a deficiency has been associated with heart disease, certain cancers, strokes, infectious diseases, diabetes (both types), dementia, depression, skin disorders, and a host of autoimmune diseases. Low levels of vitamin D in the body also mean that calcium cannot be absorbed: this may result in osteoporosis. The human body makes vitamin D as a result of the sun’s UVB rays coming into contact with our skin. Vitamin D deficiency is extremely widespread in this day and age and it appears that two things are largely to blame: a lack of sun exposure (because so many people now avoid the sun) and a diet that’s low in in vitamin D-rich foods (like shellfish, fatty fish, and organ meats). Yet most people who are deficient in vitamin D don’t even know it: the only way to know for sure if you are low in vitamin D is to get a blood test (the test your doctor should order is 25(OH)D, also called 25-hydroxyvitamin D). Depending on your skin tone and where you live, approximately 15 minutes of exposure on 25% of your body two to three times per week may allow you to meet your vitamin D needs. BUT: UVB is only available during midday hours when the sun is highest in the sky (exactly the time of day we’ve always been told to avoid) and you can’t get it when you’re wearing sunscreen, or through a window, clouds, or smog. Very fair skinned individuals (yes, redheads: I am talking to you) will require the least amount of exposure (probably more like 10 minutes) while those with darker skin will need to spend more time outside to reap the sun’s benefits (melanin acts a natural blocker of UVB rays). If you’ve previously avoided the sun like the plague, make sure to start with just a few minutes at a time so you can build up some tolerance. I recommend continuing to put sunscreen on your face (check the Environmental Working Group’s website for safe and effective sunscreen recommendations) because it’s a small area and the skin is thin and prone to sun damage. Your arms and your legs (if you’re wearing shorts) can and should go sunscreen-free for the amount that you discover is right for your body each day, though. After that, do put on sunscreen if you’re going to stay outside. Please know that I am not at all recommending that you sunbathe for long periods of time each day…I honestly don’t think that’s good for your skin’s health or appearance long-term. I am also not advocating that you use tanning beds if you can’t get out in in sun: as far as I know, they’re pretty terrible for you (I have seen reference to safe tanning beds online but I don’t know anything about them). You never want to burn, so if you’re traveling to a place where the sun is stronger than at home and where you may be outside more than usual, be very careful: you might only need 5 minutes to get the amount of UVBs you were getting at home. Make sure to use a sunscreen with a high SPF if you’re doing the beach “thing” (though I’ve read that there is no point in going above SPF 50), and make sure to cover yourself and/or seek shade before you get to the point of overdoing it. Remember that it’s the bad sunburns (and your genes, unfortunately) that put you at risk for skin cancer. Keep in mind, though, that the skin cancers generally associated with the sun are not usually life threatening, and I’ve seen no compelling evidence that deadly melanomas are caused by sun exposure. In fact, it’s entirely possible that toxic chemicals in some sunscreens may be contributing to skin cancers. If you live in the northern latitudes, wintertime is most definitely a problem: there’s generally just not enough sun during that time of the year for you to meet your vitamin D requirements. Upping your intake of foods rich in vitamin D is definitely suggested in the winter (free-range egg yolks, raw milk, wild salmon, sardines and mackerel are all good sources)…you can also eat foods that are fortified with vitamin D (though there is some evidence that the vitamin D in these is not well absorbed by the body). You may need to take vitamin D3 if your levels are low and you can’t get enough from then sun and/or food (or consider taking cod liver oil as a whole foods alternative to supplements), but please note that while you can’t overdose on vitamin D from the sun, you CAN overdose on vitamin D from foods and supplements. For this reason, please only take vitamin D under the supervision of a physician. A few final words on this subject: I’ve read that you shouldn’t shower right after sun exposure because it will interfere with vitamin D production. I need to do some further research on this point, but it does make sense to me to wait at least a few hours, or longer if possible, to bathe after you’ve been in the sun. Something else I need to research further is whether there’s truth in the statement that a diet high in antioxidants is naturally protective against sunburn. I think of the sun as medicine. I don’t lie out in the sun, but do I try to enjoy walking, gardening, and just being outside whenever possible in order to get my vitamin D. Our ancestors spent much of their time outdoors and I believe our bodies evolved to support this, so it just doesn’t make sense to me that we should cover every inch of ourselves with sunscreen whenever we’re outside. That said, I don’t want my skin to get “leathery” from too much sun and I prefer to avoid wrinkles for as long as possible, so I do wear sunscreen on my face at all times (I also use it on my whole body whenever I’m outside for a while). In addition to getting a little sun, I make sure to include foods that are naturally high in vitamin D in my diet, and I may supplement my diet with some cod liver oil this winter. How about you? What is your relationship to the sun? Let me know what you think about this week’s One Simple Change! 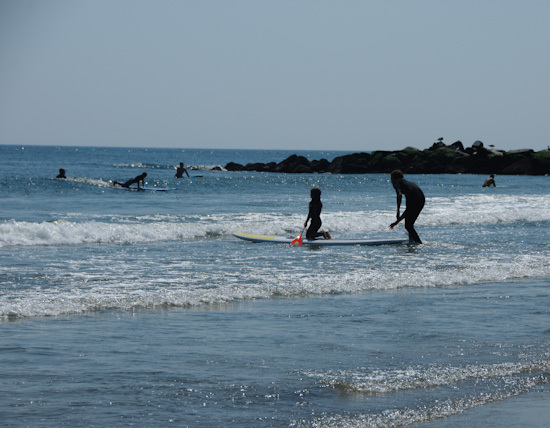 Valuable info – and glad you learned to boogie board. I was older than you when I learned. It is fun and terrific exercise! I love this, Winnie! I feel so much better when I can spend at 15-20 minutes in the sun each day – physically energized and my spirit is renewed. If I’m planning on more time than that, I apply sunscreen (& reapply as needed). I agree with you. I’ve always felt intuitively that the sun can’t be flat-out bad for us; it just doesn’t make evolutionary sense. I tend to avoid sunscreen and seek out shady outdoor spots. And I always feel happier and healthier when I’m getting lots of sun-time. I am reading things indicating our diets may impact how the sun affects us as well; I find that possibility really fascinating. (We are dabbling in paleo.) Looking forward to your book! I love this series. As someone who spent this summer trying to restore her Vitamin D levels, I’ve been doing lots of research myself as well. You’ve probably already visited the Vitamin D council’s website (they have a ton of great info). Sunshine far outweighs food or supplements as an effective source of Vitamin D, so if you’re deficient (which most people are), your sunshine recommendations are the best way to build up levels. The only thing I do differently is I actually do sunbathe for 20 minutes at high noon (without sunblock) and I wear a bikini, because the torso is the most effective collection site for Vitamin D – strange but true. I revel in the sun without going overboard. A few moments outside always get my energy kicked back up while I’m working. Luckily my school library has a back door that goes right outside so it is easy for me to take a sun break during my day. Happy to read you did some boogie boarding! I would love to try stand up paddle boarding. Great photos, too! As always, I learn from this series. I did not know that one should wait a bit before showering after sun exposure to allow maximum absorption of Vitamin D. I know you said you have to research this more but now that you have planted the seed, I can do it. Thank you for another very informative post. Thank you for taking the time to do such extensive research. I always learn so much from reading your posts! I had bloodwork done a few weeks ago and found that I was low in vitamin D for the first time in my life. I didn’t realize that you can only get vitamin D during peak sun hours. (my doctor said to go outside more, but I was confused because I usually avoid mid-day sun and go out in the afternoons). I’m also glad you noted organ meat and fatty fish as sources. I didn’t feel comfortable drinking vitamin-D enriched milk (I buy milk from a local farm) and have been trying to incorporate more fish into my diet (and by ‘more fish’ I mean fish. period.). Thanks for another great post, Winnie! I love sunny day, because it is the time where we can enjoy outdoor activities the most. It would be a great bonding time but we must not forget not to expose ourselves to the sun for a long time. We might consider wearing sunscreen or sunblock for our protection, it is still better if we give importance ti our health. Also by the use of the sun, we could get Vitamin D which is also essential to our health. Cholecalciferol is synthesized in the skin from 7-dehydrocholesterol under the action of ultraviolet B light. It reaches an equilibrium after several minutes depending on several factors including conditions of sunlight (latitude, season, cloud cover, altitude), age of skin, and color of skin. :`’..